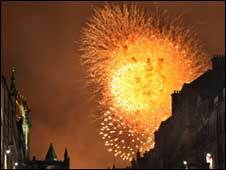 A spectacular fireworks display lit up the Edinburgh skyline as the city's international festival drew to a close. About 250,000 spectators turned out on Sunday night to watch the extravaganza from vantage points across the city. A team of international fireworks technicians used more than four tonnes of explosives and thought up hundreds of firing sequences. The Scottish Chamber Orchestra provided a musical back-drop to the festivities, conducted by Nicolae Moldoveanu. He led them in Brahms' Hungarian Dances and Dvorak's Slavonic Dances. About 12,000 spectators packed into Princes Street Gardens to watch the Bank of Scotland Fireworks Concert. A festival spokeswoman said: "The skies above Edinburgh Castle absolutely danced with fireworks from delicate to daring. "The waterfall came early on in the Brahms, followed by a series of mini waterfalls later in the evening. "The castle looked very dramatic, fitting the Transylvanian music perfectly, the orchestra played brilliantly, and the evening culminated with a stonking finale. "The crowd in Princes Street Gardens was roaring and cheering at the end." Razwana Mirza, 32, from Edinburgh, said: "We have had a great time here in Princes Street Gardens watching the fireworks. "I haven't been for years because I have been away travelling and had forgotten just what a spectacle it is. "The effort that must have gone into the display is amazing."